...and much more. lavishly illustrated with maps by Meshon Cantrill. 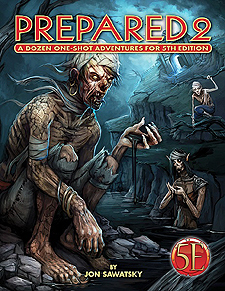 With Prepared 2, designer Jon Sawatsky has created fantastic and highly playable 5th Edition fantasy scenarios ready to use in any fantasy campaign setting, at a variety of PC levels. Never be caught without a pot again! These adventures feature monsters from the core 5th Edition and fro the Tome of Beasts.